The RF cold plasma jet source was designed to work at low power (less than 25 W) and enable scanning temperature sensitive materials. It has small size: a total length of less than 100 mm and a diameter of 8 mm at the tip. 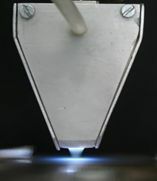 An image of this plasma source is presented in Figure 1. 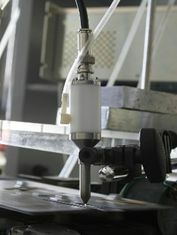 The construction of the RF cold plasma jet source is based on a parallel plane electrode configuration consisting of a powered RF electrode and a grounded nozzle. The ionized gas expands in the open atmosphere as a jet of 1 mm diameter and up to 5 mm length, depending on the working parameters. The operation conditions for atmospheric pressure plasma source are: RF power 5-25 W and argon flow 100-5000 sccm. The construction of the DBD plasma source at atmospheric pressure is based on a plan-parallel discharge (gap width of 1 mm) with a single dielectric barrier defining with the grounded electrode and the side spacers a trapezoidal discharge volume, higher at the gas insertion point and lower at the plasma exit. In Figure 2 is presented an image of the DBD plasma source. In this configuration the discharge fills the entire volume of the grounded plane electrode and dielectric barrier. The jet of plasma thus obtained is a solid extended plane, which expands through a nozzle of rectangular shape, having dimensions of 1 x 5 mm. The DBD plasma source works stable argon at powers between 5-25 W, atmospheric pressure and gas flow between 100 and 5000 sccm. Both atmospheric pressure plasma jets were generated by means of RF (13.56 MHz) capacitive coupled discharges, using Ar as feeding gas (99.999 % purity).